The Wild Trout Association invites avid fishermen to visit the Eastern Cape Province of South Africa to indulge in some really relaxing fishing expeditions in search of delicious trout. 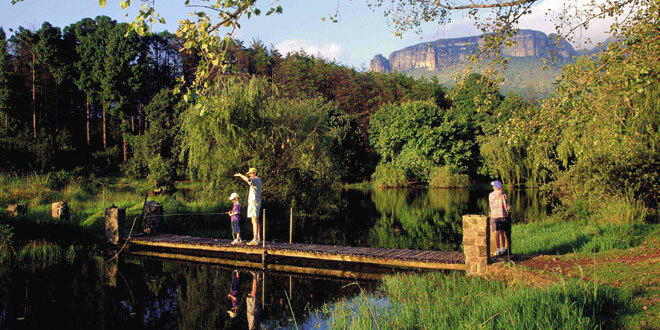 Their official waters are at the southernmost tip of the Drakensberg Mountain Range, extending from Lesotho. They continue through the Stormberg Mountains (in Dordrecht and Molteno) and westwards. The Kraai River is the most important in the area when it comes to trout fishing. It begins on the escarpment slopes and connects to the Orange River at Aliwal North. The Kraai then flows into the Atlantic Ocean at Oranjemund. Rhodes – this town is the site of the greatest concentration of running water in the area. The water is easily accessible and very rewarding. Barkly East – visit Langkloofspruit for superior trout fishing opportunities. New England – home to the only trout hatchery in the area. Lady Grey – this fishery is supported mainly by a beautiful stream in a deep sandstone gorge. To find more fishing locations in the eastern Cape visit the SA-Venues.com site and see holiday lodgings Eastern Cape should you wish to book a place to stay.